are looking for? Don't hesitate to contact me, as I may have it, be able to get it, or custom make it. when a regular leash is just too long. These are made to last! 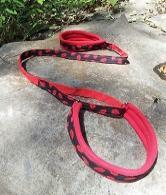 The 2 in 1 leash combines the traffic lead with a 4ft or 6ft leash. this leash offers the best of both worlds! your dog some extra leg room. Single ply, 1" nylon with 5/8"
are used in sports like barn hunt, fast cat, lore coarse, and agility. Light weight, but very durable. 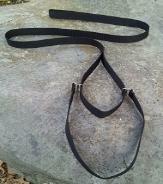 Customize your martingale leash as you want it. 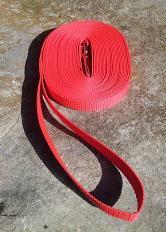 Choose between: 1" or 1 1/2" wide webbing. Line the handle with fleece or not. Line the collar with fleece or not. One solid color or multiple colors. Other neck sizes can be made. 1.5" wide webbing, and have a 5/8"
Plain or with an accent fabric. With or without a fleece handle. I can make other lengths upon request. This leash is a multi purpose leash. 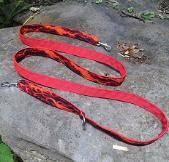 It features a 5/8" bolt snap at each end of the leash, with a welded o-ring sewn sewn 12" from one end. 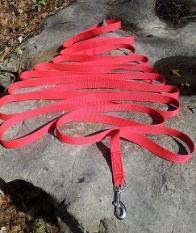 You can use it for many different purposes from a regular leash, to a shorter leash. This can be done in a solid color or with an accent fabric. (measured from tip of snap to tip of snap). Customized sizes can be made.